Pompeii is just south of Naples and is the most important of the Roman towns, that were completely covered by the eruption of the Volcano Vesuvius in 79 a.d. People were covered in ash doing whatever they could to survive. The ash and cinders covered and preserved the scene exactly as it was at that moment. This city laid buried and forgotten for hundreds of years. Numerous excavations have taken place and it is now the best preserved specimen of an ancient Roman town in existence. The visit lets one know how the old Romans lived in the city, through the perfectly preserved paved streets, frescoed houses, shops and taverns along the road, painted slogans and scratched graffiti on the walls. You don’t need to use your imagination because all the daily life details are still alive. 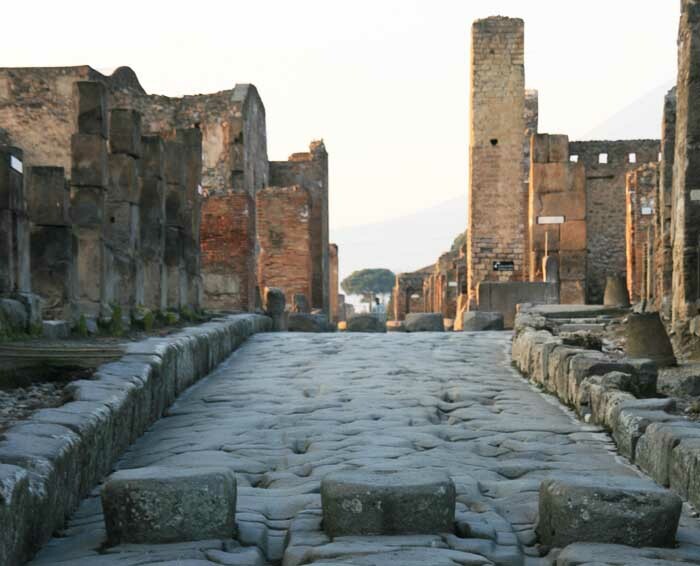 The tour in Pompeii takes at least 2 hours, better 3 hours for those who love archaeology. Anyway you may not see everything in a half day, because the old city is pretty extensive.